Meet the flash drive that stands out. BAR Plus is made-to-last. Its sleek, eye-catching magnesium unibody elegantly tapers out into a convenient, comfortable grip. Attach a keyring for the security of knowing it's safe and secure whether you stow it away, or take it along with you. Ideally suited for PCs or laptops, BAR Plus gives fast and durable file-transfers an elevated sense of style. Get your time back. Fast and convenient read speeds up to 200 MB/s with the latest USB 3.1 standard gives you more time to work, play, watch, and create. Send a 3GB 4K UHD video file from your Bar Plus to your PC in just 14 seconds. Files stay secure, anywhere you go. 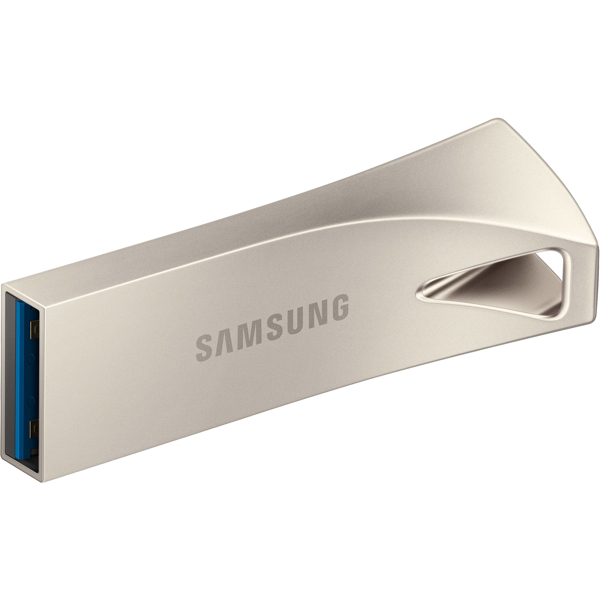 Samsung's leadership in flash memory makes the Bar Plus a trustworthy drive to store your valuable data. It works through it all with a waterproof, shock-proof, temperature-proof, magnet-proof, and X-ray-proof body, all backed by a 5-year limited warranty.